Why isn’t my blog making money? What am I doing wrong? Can you really make money blogging? If you find yourself asking these questions, you are not alone. After seeing 25%, 50%, and even 400% month-over-month growth and hitting 140k pageviews as a new blogger, my confidence was shaken to its core after traffic absolutely tanked. 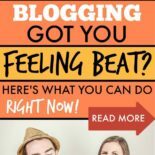 If you are puzzled as to why you aren’t making money blogging and are looking for some no B.S. tips, read on to find out how I recovered after a total blogging meltdown and doubled my income as a blogger with under 1 year of experience. For years I have read inspirational income reports published by my favorite bloggers and I thought to myself, if only. These people make tens of thousands of dollar each month, travel the world while blogging, and generally live a life I could only dream of. I started my blog, not only as a creative outlet to share exciting ideas and projects but also as a way to make money. 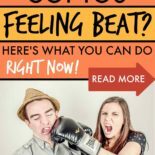 I am no stranger to side hustling, and I wanted to build a successful blog that could eventually deliver a full-time income. You’ve read them, I’ve read them, we’ve all read them! Let’s just quickly dispell some dirty little blogging lies that get perpetuated over and over. You will make $x,000/month within 6 months – The exception, not the rule. Blogging is not a get-rich-quick scheme; building a successful blog often means investing time, sweat, money, and sometimes tears (okay, maybe lots of tears) and being satisfied with making peanuts — at least for a while. Blogs that succeed and make money very quickly often either a) started at a time when the rules were different (read, algorithms) or b) are run by someone who has prior blogging knowledge to leverage for fast growth. Anyone can blog – Sure anyone can start a blog, but not everyone can make money blogging. If you are starting a blog with no prior experience you are will to need invest time and money in endeavors such as photography and photo editing, learning WordPress and HTML, managing social media and scheduling tools, studying search engine optimization — it also helps if you are a decent writer! I started my blog blithely buying into these blogging myths and quickly realized that I wasn’t going to be making $6,000 in three months *cue the Debbie Downer music*. However, if you have the drive, determination, and willingness to put yourself out there, take the hits, and roll with the punches, I believe you can make it! Now let’s take a look at how I recovered from a total blogging meltdown to go on to double my income as a new blogger — in my January 2019 blog income report! I was pretty spoiled for a long time; I came to expect 25-50% monthly traffic growth. In October of 2018 (my 8th-month blogging), my blog grew over 400% compared to the previous month and I received 140,000+ pageviews. I was elated, but also extremely wary since most of that traffic was seasonal and coming from Pinterest. Turns out I was right to be wary; in November traffic nosedived and I went from 140,000 pageviews down to 24,000 pageviews — but the drop didn’t stop there! Well, for me November and December were a lot like New Moon, only IRL and a lot more depressing. Halfway through December, I realized I wasn’t even going to be getting anywhere close to growth; in fact, my numbers were sliding backward…and it scared the poop out of me. 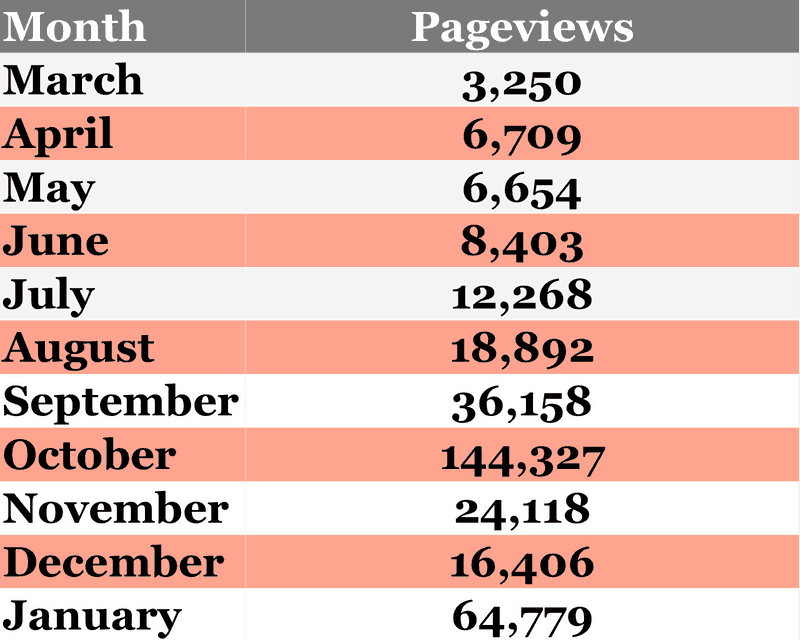 If you look at my blog’s monthly pageviews from its inception you can see that in December traffic decreased until it was commensurate with around what I was getting in my fifth and sixth months of blogging. So what to do? What can you do when you experience a dramatic drop in traffic — or even if you aren’t getting blog traffic in the first place? After spending some time in panic mode, then a few more days hosting a pity party for one, I decided to dig down deep into my soul — that is to say, dig deep into Google Analytics. Because what is the soul of your blog if it isn’t your audience and what they are interested in reading? If a blog post falls in a forest and no one is there to hear it, will it make a sound? The point is that when something is going wrong the correct response is to take a look at what does work and build upon that. 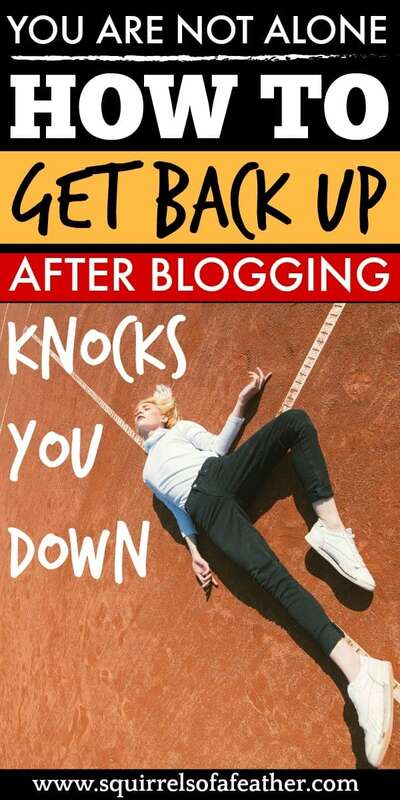 Most bloggers hit a wall at the cusp of success; repeated failures make them want to quit. Your readers are everything. Unless you are blogging for a hobby, you should be blogging for them and (not yourself). If you want to make money blogging, you need to blog for your people. But how do you know what your readers care about? How do you know what the people come to your blog like? For a long time, I ignored what Google Analytics and all the blogging gurus were telling me: to niche down. I stubbornly thought that I could replicate the success of blogs like Chasing Foxes and blog about everything my little heart desired. In fact, I initially started this blog with the idea that it would be a frugal lifestyle blog. Guess what? No one cared about how we save half our income, wanted to read about wedding budgeting, or check out my frugal living posts! I realized this when I dug deep into Google Analytics and made the decision to cut those topics from my blog — I decided to niche down. When I made the decision to niche down, that meant I wanted a more beautiful and focused blog theme that supported my focus on creative homemaking. That’s why I decided to go with the Restored 316 theme, Captivating. All in all, it took me only four hours to switch my blog fully from Delightful Pro to Captivating thanks to the excellent tutorials and tech support from Restored 316 and my sparkling new blog design was ready to go! 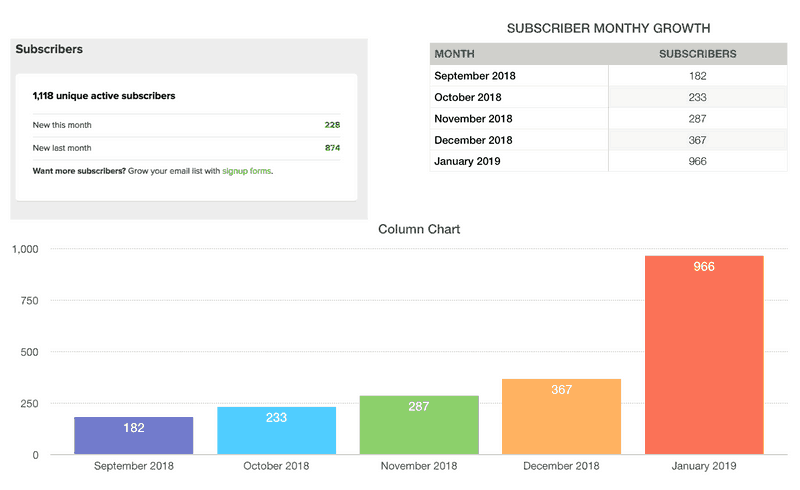 I switched my blog’s theme on December 28th, 2018 and you can see in the image below my email subscriber growth soared immediately after, more than doubling from December to January! Sometimes a simple change can make a big impact. Is my blog easy to navigate and read? Are there multiple places readers can sign up for my emails? Are social media buttons easy to find? Do they all work? Do I have enough images in my posts? Are they long enough? Are they Google front-page quality? While Pinterest is great for getting traffic to your blog quickly, in the long run, you will find (as I did) that it is not as reliable as good ole SEO work — that is, search engine optimization. Pinterest algorithm changes hit me hard in November and December and that’s when I knew it was going to be important to get more readers direct from search engines like Google and Bing. Since I knew December was going to be a bust anyway, I decided to invest in some highly recommended resources that I knew could help me focus on getting more organic traffic and then I spent some time updating old posts with the information that I found. 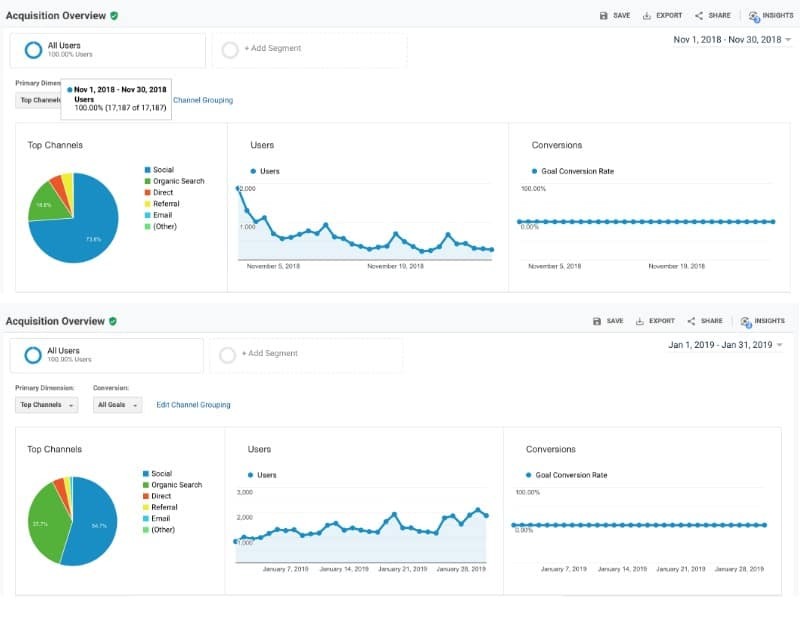 Below you can how my blog moved from the “valley of depression” in November and December 2018 to experiencing a traffic surge in January 2019. While I am not nearly at my peak traffic month of October 2018 I am feeling much better than this growth is sustainable. I continued to study and implement the strategies I found into January and am still working through the course. 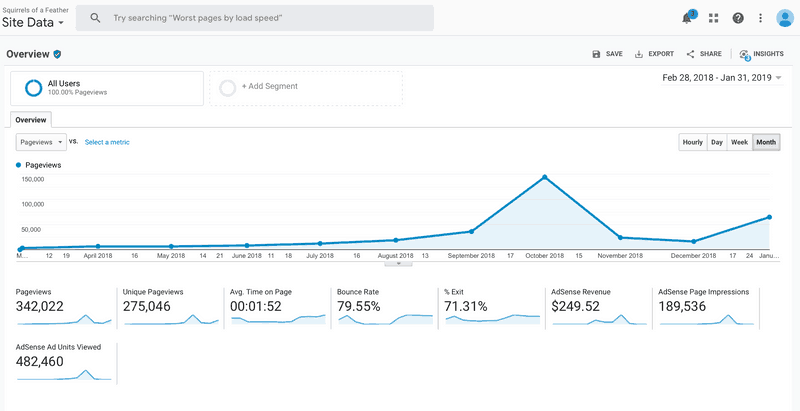 Here are the results I saw after focusing on SEO for traffic. I would say they speak for themselves — the amount of organically obtained users increased 500%! So far I am extremely happy with the results that I have seen implementing the SEO techniques and other information from my blogging course. So how much did all this organic traffic earn me? Unfortunately, a big drop in ad revenue RPM (that’s how much you earn for every 1,000 ad impressions) from December to January meant that I was earning about half as much for every 1,000 views. However, because my traffic increased dramatically I still earned more overall compared to December and was happy to see the rates slowly creep up throughout the month of January. Money made from MediaVine ads. Money made from Amazon affiliate marketing. I blog about blogging every once in a while because I enjoy it and I want to help other new bloggers who are struggling to get their voice out there and make money blogging and who feel FRUSTRATED and lost at times, just like I do. If you look at the above income report you will see that of the nearly $1,000 I made in January only $94.75 of that was from recommending blogging resources! I want you to know that even if you don’t blog about blogging it is possible to make money! I mostly write about recipes, organization, and crafts/DIY and still manage to make money blogging about those topics. I also want to be an honest voice for the little-guy bloggers out there who feel the daily growing pains of blogging and who are constantly being bombarded with “buy this” and “do that” from all sides and don’t necessarily know who they can turn to with trust and who is just trying to make a buck off of them. To you bloggers I would say, find your tribe. Surround yourself with people you can trust and who want to see you succeed. Who will say to you honestly “this course is a piece of sh*t” and “girl, you gotta buy this“. When it comes to blogging it pays to invest in education, but only if you know the right resources. If you want to work on SEO but are feeling a little lost, sign up for this free SEO cheatsheet and accompanying instruction manual. Thanks for the useful tips! I need to focus and try some of these. I’m impressed you installed your own theme! Thanks, Lauren, because the R316 tutorials are so great it really wasn’t an issue! Just like when I first got it I was able to do like 99% myself then chatted with Lani for the rest. 🙂 Thinking to update your blog? Hands down, this is THE best post I’ve read on traffic and making money blogging. I love your honesty. Blogging is tough to make an income from when you are first starting out. Even as a blogger of several years, it can get very frustrating. You made some excellent points and offer solid advice. I’m sharing everywhere! Kari, I get it and it is really hard not to fall into the comparison trap! I think it’s really all about targeting the right keywords, taking good pictures, and recommending stuff that you love. Honestly, my gift guides don’t do half as well as I would like but when I write a post recommending something (like the paper shredder that I adore in my KonMari posts) people love it! Courses can get expensive but I like to think of it as an investment that can pay for itself. The course that I recently started doing recently had the price go up — it’s WAY more than $200 now — but I got to 140k pageviews and qualified for MediaVine using the stuff I learned in Building a Framework, by Abby Lawson which is a very affordable $97. I also decluttered with the KonMari method and sold my old stuff on eBay and got 10k from that, which helped fund my blog! Maybe try and sell some old junk on eBay or PoshMark to fund some education endeavors? Excellent post! You hit on a point I think a lot of people miss, that sometimes it seems like the only way to success is to blog about blogging and promote related products. Great to see that is not the case! Thank you for this post! It is so inspiring to see these results, Marissa! I’ve been trying to spend more time on SEO. I screwed up my SEO stuff and now I have to wait up to 6 months for it to correct. For the months going forward, I’m going to put less emphasis on Pinterest. I’ve been doing that and I see my income is falling. That is okay bc I want to focus on the long term which is Google traffic. Amazing post Marissa!! You are a wealth of information and I for one am so thankful you share it!! I am going back through this post and clicking all the links to check them out! I’m so excited for you and you quick growth! Congrats on that. I also want to check our Semrush when I have a few minutes. SEO is my focus for this year and I know it will pay off! Pinning to come back to later. Thanks so much, Joleisa! Yes, SEO is so important and I wish I had paid more attention in the first 6 months and invested then. Good luck to you! I really loved this post… I’ve been looking around your site for a while.e and I wanted to let you know you have a great “voice”. Your blogaversary post especially cracked me up. Totally digging this post!!! Thank you so much!! Valuable information, as always!! Congrats on your successes and thank you again for being so open with your blog business. Best wishes always and here’s looking forward to your second year of blogging!! Thanks, Dana, I always dig your comments. 🙂 Hope you have a great 2019 as well!